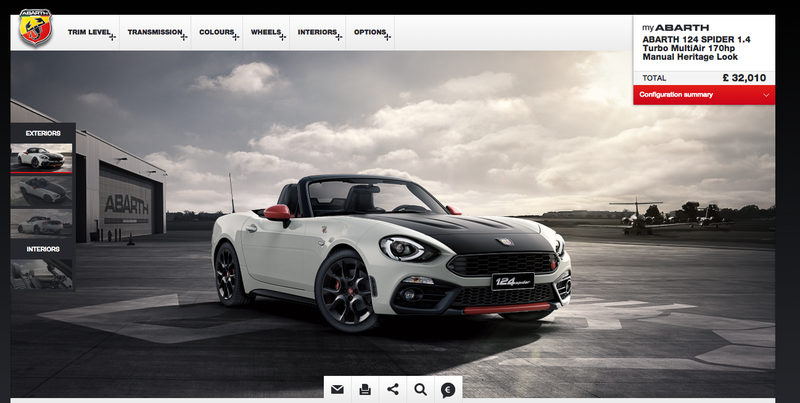 The 2017 Fiat Abarth 124 Spider is coming, and it will be the greatest car forever and ever and I DON’T CARE WHAT YOU SAY SHUTUP. It will be the best. That is final. And right now there’s a European configurator up, so you can spec yours out just how you’d like it. Within reason, of course. Prices and options will likely change at least somewhat by the time the car makes it here. That’s mine, right there. There’s my baby. Gonna have to move out of the city to get one, but sure, she’ll be totally worth it. It’ll only be £32,010, too, which is British money, which is not real money, so it might as well be free. How would you have yours? Let us know in the comments below!